The weekend when the pendulum swung in the title race. But which way? A long while ago, a former British prime minister once declared that “a week is a long time in politics.” Harold Wilson’s phrase was meant to encompass how the agenda and public opinion of a government can be influenced not only by the actions it takes, but also the way in which unforeseen events can sometimes change both the state of affairs, and the affairs of state. If Wilson’s description of politics is true, very much the same can probably be said for a weekend in Premier League football. 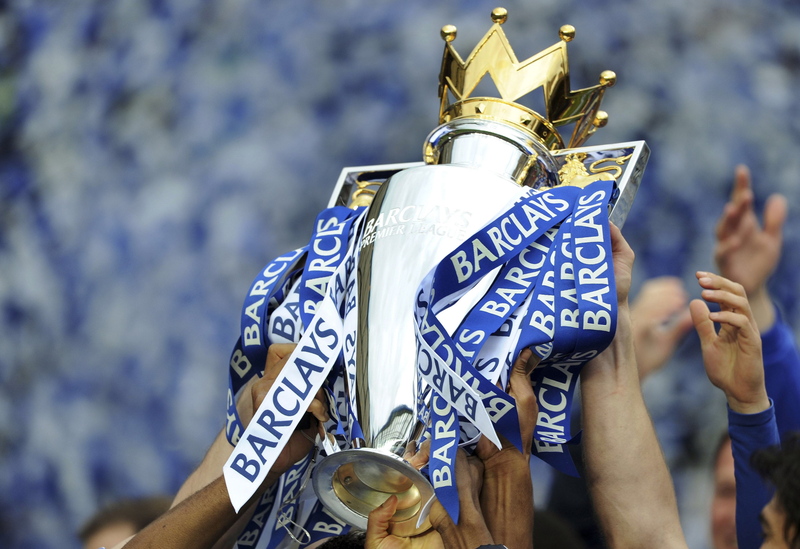 Who’ll be lifting the Premier Leaue trophy in May. Did last weekend could have decide the issue? Last weekend’s domestic programme began with leaders Chelsea journeying north to face Alan Pardew’s rejuvenated Newcastle United. The Blues have a less than inspiring record against the Geordies in recent years, and Jose Mourinho is yet to taste success there in a league game, despite this being his fourth attempt. True to historic tradition, Newcastle triumphed, inflicting on the Portuguese’s charges, their first defeat of the season. All talk of an unbeaten season was immediately consigned to the dustbin, and the online betting company that decided to payout on the Blues ending the season as champions began to look somewhat less than wise. A PR stunt perhaps, but calling the title before the turn of the year was always likely to be extravagant. 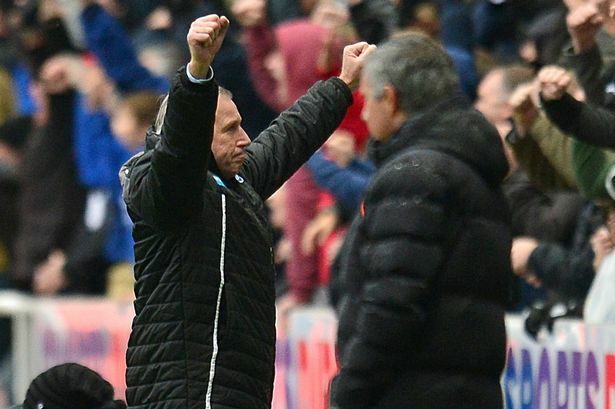 as Alan Pardew celebrated the Geordies’ victory, Mourinho knew Chelsea’s lead was now vulnerable. Or maybe not. The defeat left Chelsea half-a-dozen points clear at the top, although Manchester City still had a game to play. The problem was that a couple of weeks previously, that lead had been eight. Then, another visit to the north-east saw former Chelsea boy, Gus Poyet’s Sunderland build an obdurate red and white wall around their penalty area, and then sit behind it as the Blues’ expensively assembled attack battered away at it to no avail. There were even the occasional breakouts that, on another day, may have secured all three points. The points were shared however. A City victory at Southampton meant that eight became six. Was there a slip up on the cards? Despite a reassuring 3-0 victory over Spurs in the midweek however, the threat that Sunderland offered turned out to be presaging of the Newcastle result. This meant that a City victory would cut the lead to three. In a less than inspiring game, Manuel Pellegrini’s team took the points with a 1-0 victory secured by a Yaya Toure penalty, awarded following a Jagielka challenge on James Milner, which resulted in what is often termed as a ‘soft’ spot kick award. Looking at the raw results and a lead now down to three, many could be forgiven for thinking that City now had the ‘big mo’ – momentum. The City result however hides just how ‘long’ the weekend programme was. In just the second minute of the game, Sergio Aguero, currently topping the Premier League’s goalscoring table and a veritable goal machine in human form, collapsed under a fairly innocuous looking challenge, clutching his knee. Immediately subbed-off – and in the process destroying the Fantasy League prospects of the writer who had eventually succumbed to the tempting desire of burning a number of points to put the Argentine into his team – ligaments looked the problem, and it was duly confirmed. In such a short time, the pendulum had swung towards City, after Chelsea’s northen blues, and then potentially back again, as the Manchester club were shorn of their talismanic striker. And so to the future. The anguish and pain on Sergio Aguero’s face told of the severity of his injury. The prognosis on Aguero suggests a lay-off somewhere between four and eight weeks, and this is where the length of a week in football rears it’s head again. City face entirely winnable league games against Leicester, Crystal Palace, West Bromwich and Burnley before the turn of the year, all of which Aguero will inevitably miss. Then, early in the New Year, there’s also a seemingly comfortable home game against Sunderland. Then it gets a little interesting. The next game is away at Everton, then it’s home to Arsenal, before a visit to Stamford Bridge and Chelsea at the end of January. There’s little doubt a City team with Aguero would face a potentially sticky game against the Toffees, the firepower of Arsenal and a visit to west London with much more confidence than one without him. If the break is four weeks, he should play in them all of them. If it’s eight he could miss them all. With a Louis van Gaal inspired Manchester United putting a run together, there’s still time aplenty for other clubs to muscle their way into the title race. For Chelsea and City fans however, it looks like a two-horse race. Who will finish ahead may well depend on a particular length of week regarding Aguero’s fitness – or otherwise. Come next may, we may well be looking back to a weekend in December that decided the destination of the Premier League title.